Dress up your look with this stunning silver ring. With an amethyst stone at its heart, diamond encrusted silver curves in a gentle twist offering a contrast of colour and sparkle. 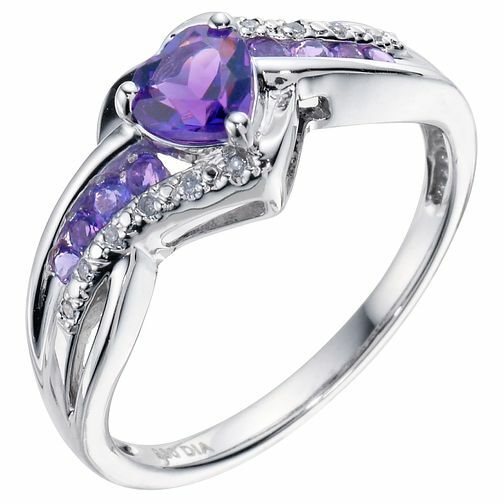 Argentium Silver Diamond & Amethyst Heart Ring is rated 4.8 out of 5 by 30. Rated 2 out of 5 by Anonymous from Gorgeous to look at I was proposed too with this ring 2 years ago. 2 weeks ago the main stone fell out. When I popped into to my local store I was quoted the price the ring cost just to repair it. So took it to another reputable jewellers to repair it. When I recieved it back all the purple stones we,'re clear. I was advised that the stones we,'re not genuine amethyst but treated cubic zirconia. As the treatment washed away during the cleansing process And the silver is not Argentinean silver but basic 925 stirling silver.